Once upon a time a steakhouse was the final word in fine dining for me. While those days are long gone, I still have a fondness for a great steak. A few years back there were a rash of high-end steakhouses opening in LA from Wolfgang Puck's CUT to the trendier BOA and STK steakhouses. 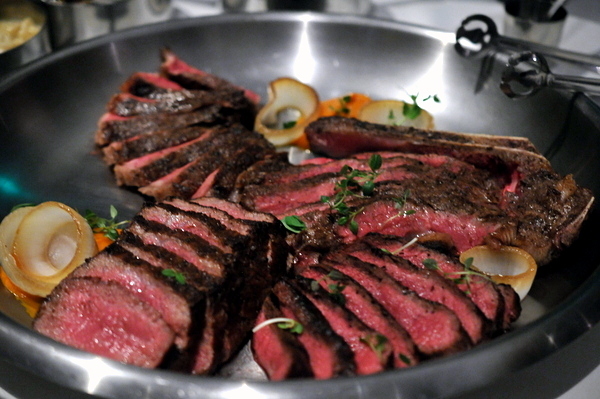 Since then the LA dining scene has grown a bit more sophisticated with the rise of places like Trois Mec and Alma; still I was intrigued when I heard Michael Mina would be opening a new outpost of his Bourbon Steak in Glendale. With an interior inspired by the golden age of aviation, Bourbon Steak seems to straddle the line between classic and contemporary. Indeed the atmosphere feels like a classic steakhouse/boys club though the food leans decidedly towards the modern which I favor over traditional steakhouse fare. 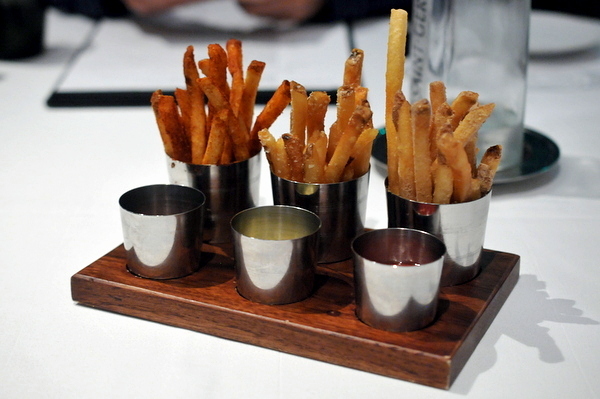 The meal at Bourbon Steak kicked off with a rather unique amuse: three uniquely flavored preparations of duck fat fries each paired with an appropriately flavored sauce. 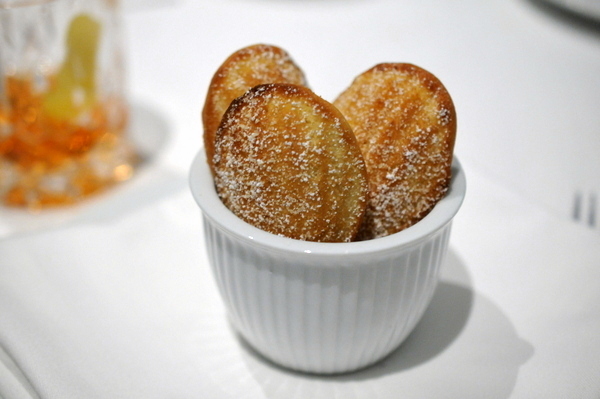 The fries themselves are superb, dense crispy exterior with a fluffy interior and plenty of inherent savor. 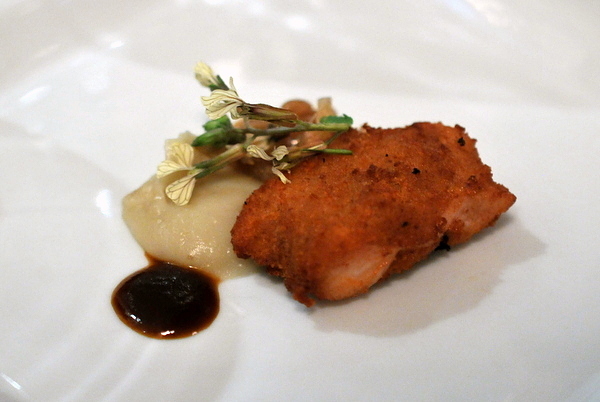 The first flavor was a meaty pastrami spice coupled with a smoky vinegar-laced sauce. The Parmesan fries were the most conventionally delicious cheesy zest paired with the rich tangy Caesar. Last up was a dill-laced variety that went nicely with the bright tangy ketchup. I was surprised at the depth and breadth of Bourbon Steak's cocktail and spirits program. 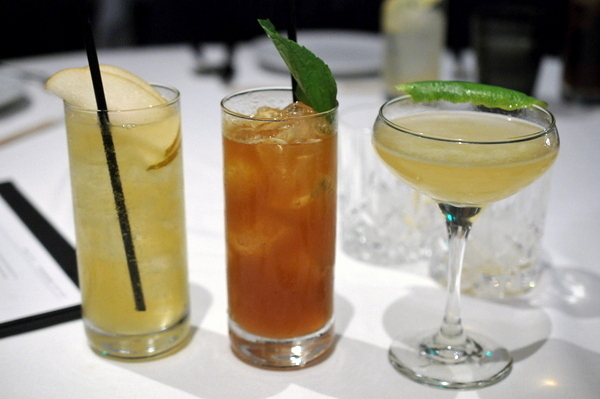 The restaurant offers both modern and classic cocktails with an emphasis on bourbon and whiskey. 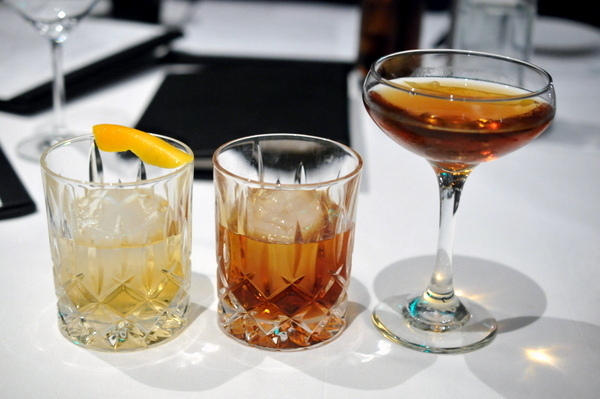 Beside the conventional drink options, diners can also choose for table-side Japanese Whiskey or Bourbon presentations. Our first round of cocktails ran the gamut of Bourbon Steak's offerings. The barrel-aged Tlaquepaque had an emphatic woody note from the reposado concentrated by the aging. The peach creme offered a cloyingly sweet counterpart that the fragrant orange bitters couldn't quite balance. Unlike the previous cocktail the Avantgrand's keen savory wood smoke and brine were enough to balance the heft of the banana making it the table favorite thanks to its alternating blend of smoke and sweetness. The final cocktail came from the classics, named for the French Quarter in New Orleans, the drink opens with soft sweet vermouth and finishes with a light tinge of medicinal sweetness. The restaurant only offered one type of bread but what a bread. 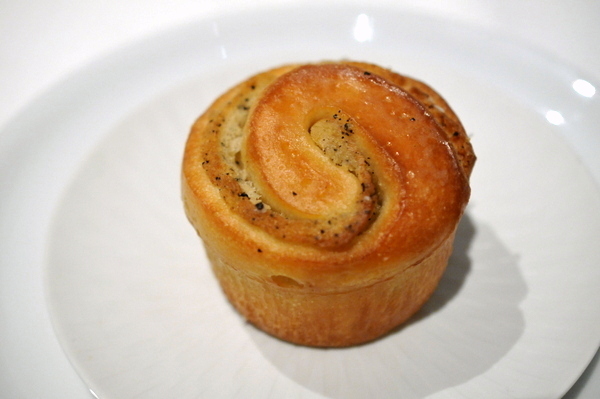 Heady waves of truffled musk roll off the warm bread though I was expecting something soft and tender as opposed to the slightly dry toasty texture. Surprisingly the restaurant only offered one type of oyster, fortunately that one variety was Kusshi; one of my all-time favorites. 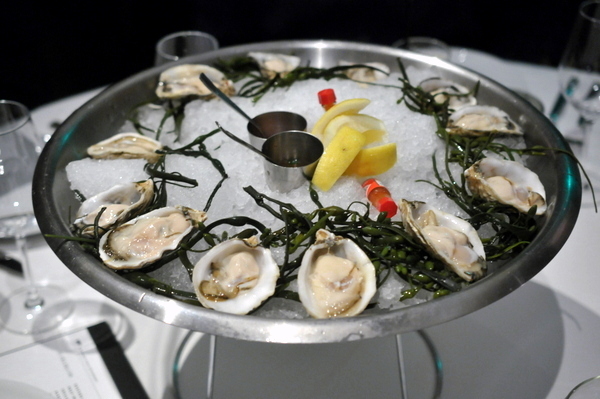 These were a bit larger than the traditional Kusshi and though they had the typical creamy body, the cucumber and melon flavors that normally characterize the oyster were largely absent. 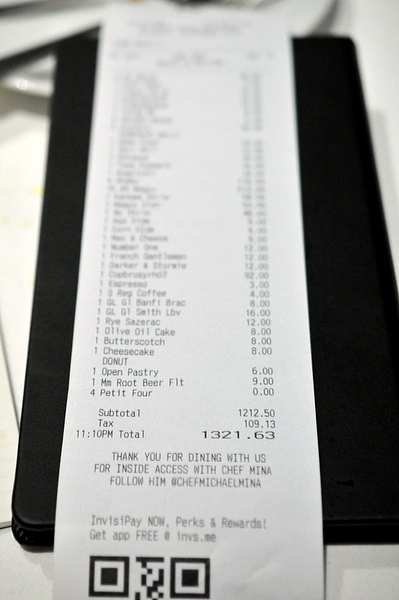 This was a special that typically comes with the restaurant's seafood tower, but the kitchen was kind enough to make us an a la carte portion. With each bite of the dense snappy bits of fish , the meat exudes oily fatty relish that contrasts beautifully with the tangy spice-tinged dressing and the fresh onion topping. I had my reservations about this next course, thinking the faux-Asian rolls might feel a bit tired. Indeed the generic savor of the rolls was fairly pedestrian, but the accompanying herbs added a particularly poignant contrast as did the astringent piquant tang of the dipping sauce. Our second round of cocktails wasn't quite as impressive as the first. The French Gentleman was a touch medicinal thanks the Chartreuse but with a contrasting sweetness. The Darker & Stormier was an especially difficult drink with a flavor reminiscent of Eastern medicine particularly Huang Lian or Coptis extract. The Number 1 was a riff on the Corpse Reviver but with a more cerebral herbal component thanks to the lavender and Kina which is far more complex than the more ubiquitous Lillet. Like the duck rolls, I had my doubts about this course. Indeed the dish proved to be a touch simplistic though no less tasty for it. Both fishes come dressed with a Sriracha mayo and go nice with the tangy bite of the ponzu and ginger. The crispy rice added a nice savory flavor although by the time I got to it the mayo had saturated the rice turning the ostensibly crunchy texture a bit tacky and soft. 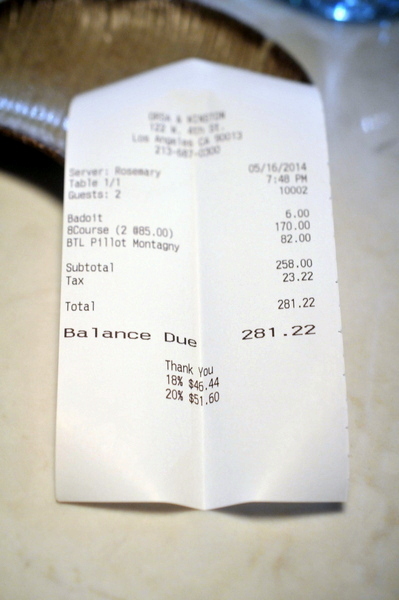 This was easily the most exciting of the appetizers and at $29 per ounce it was also far-and-away the most expensive. The delicate meat comes wrapped around a few strands of Enoki mushrooms which brings a core of springy supple structure to the paper-thin meat. 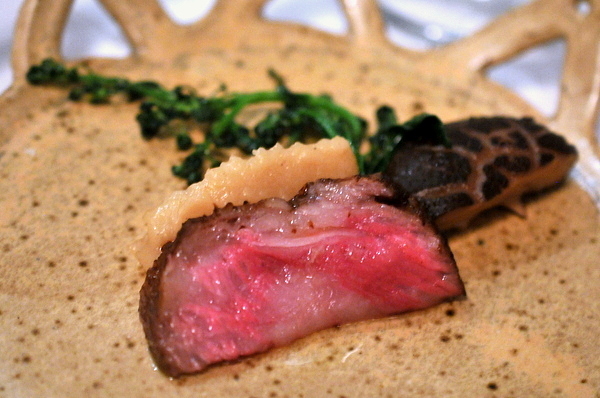 The inherent richness of the Wagyu is balanced by the bitter radish and bright herbs. The meat is good enough to eat on its own, but after a few swishes of through the mushroom broth the meat develops a flavor of rendered fat and dark earthy savor along with a soft silky texture. The plank grilled octopus was a thing of absolute beauty. The meat is dense tender and cloaked in a heady char. The meat has a persistent saline flavor but it was the nutty fragrance of the Romesco and bright tang of the lemon that dominate on the palate. Even the earthy funk of the fresh green olives were perfectly on point in the context of the dish. 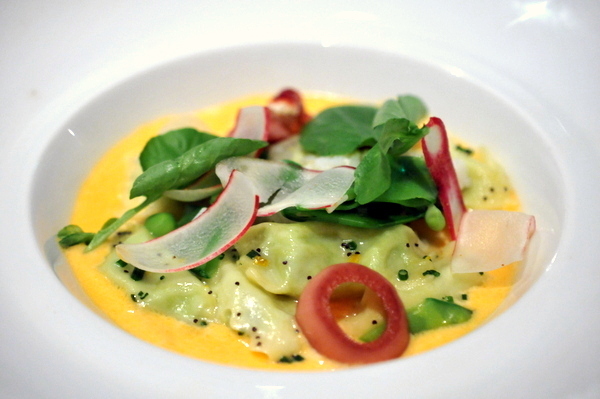 The English Pea Agnolotti was an easy choice to start with. The pasta itself was a little over-tender but the sweet nutty pea puree is everything I was expecting it would be. Though there was a smattering of lobster scattered throughout the dish it is really the bisque-like sauce that stands out; a flood of buttery shellfish luxury against the vegetal character of the peas. The scattering of vegetables contrasts quite well with the pasta and sauce particularly the keen acidity of the pickled onion which easily cuts though the weighty heft of the duo. For contemporary high-end steakhouses, it is almost mandatory that they offer not only a variety of cuts but also a mix of breeds ranging from the prosaic Angus to the sublime Japanese Wagyu. Whenever possible, my companions and I try to order the same cut to better compare the steaks, but unfortunately there was no American Wagyu Strip steak so we chose to do the Flat Iron since we thought it would be a closer comparison than the fattier rib-eye options. Though it probably comes as no surprise, the prime beef was the least interesting of the bunch, a touch stringy the steak tasted largely of bitter char without the buttery weight of the others. The American Wagyu had the most interesting grain and texture and showed more heft than the standard Angus but fell short of the international breeds. The Australian bone-in strip was probably the most enjoyable steak, with a touch of gamy complexity and pronounced but not overbearing fattiness. Ironically the Japanese Wagyu ended up being the largest of our steaks thanks to Eric who treated us and insisted on getting 4 ounces per person. We later learned that our 16 ounce steak was the largest single order beating the previous record by a healthy six ounces. The first bite of true Wagyu wasn't especially impressive but the weight of the steak became more apparent with each bite. The Miyazaki beef was the most impressive single bite but I would have struggled to finish anything more than the 4 ounce serving we each received and even that was a bit heavy towards the end. The black truffle wasn't quite as pronounced as I would have liked but the al dente pasta and rich sauce still made for a very enjoyable side. 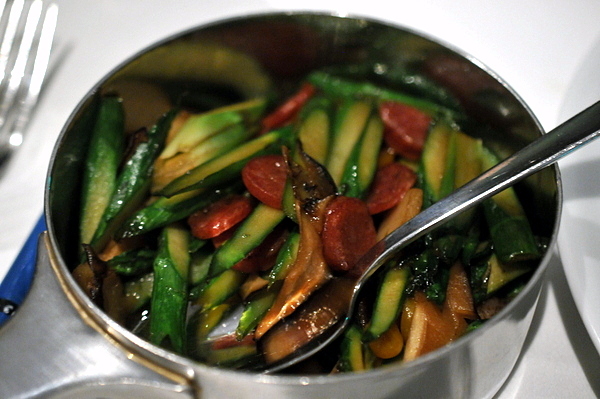 Our second side showed a surprisingly heavy Asian-influence featuring slivers of asparagus stir fried with mushrooms and lap cheong. While the flavors were a nice change of pace from the conventional asparagus served at steakhouses, I wish the vegetable wasn't so finely chopped so we could better appreciate the texture. The final side was a sweet cream corn laced with southwestern flair from the chilies. 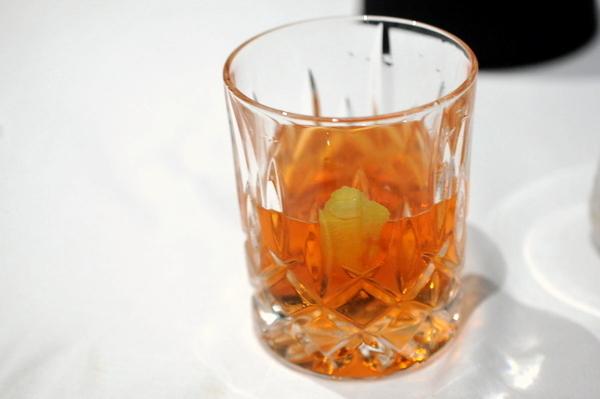 Our meal dispensed with I opted for a classic rye-based Sazerac as an after dinner digestif. 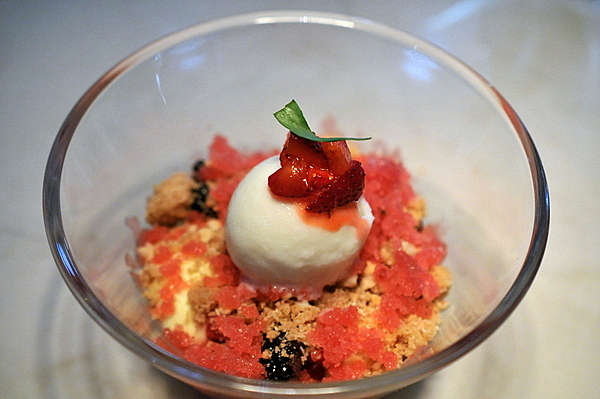 Our first dessert was a deconstructed cross between a berry cheese cake and a lemon tart with contrasting jammy and tart fruit to compliment the creamy mascarpone and buttery crumbled crust. Our server mentioned this as an alternative to their composed desserts. 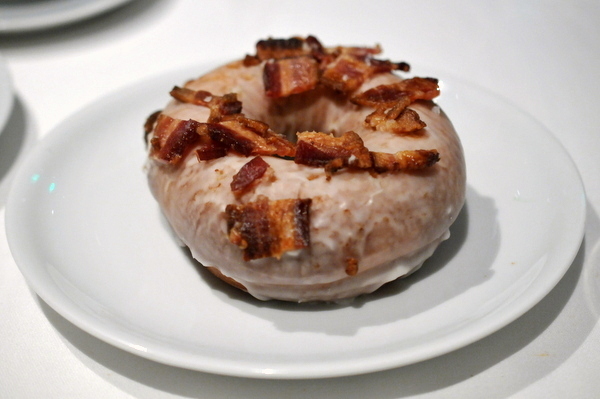 The donut certainly lives up to its name, dense and cake-y the sweet glaze and bacon compliment one another well though I have had better bacon donuts before. As much as I dislike olives, olive oil desserts are a whole other story. The subtle floral aroma of the olive oil works wonders when added to straightforwardly sweet desserts like cake or ice cream. The fresh market berries are delightfully sweet and the combination reminded me of a luxurious strawberry shortcake. Salty caramel is a must for me and though this delivered on that count the dessert felt a bit too basic even with the perfectly-made Madelines. 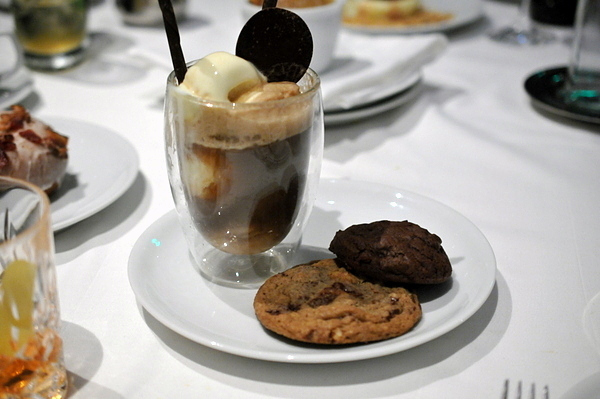 The final dessert was a root beer float saturated with rich sassafras flavor and two soft warm cookies. The combination was simple but remarkably comforting. 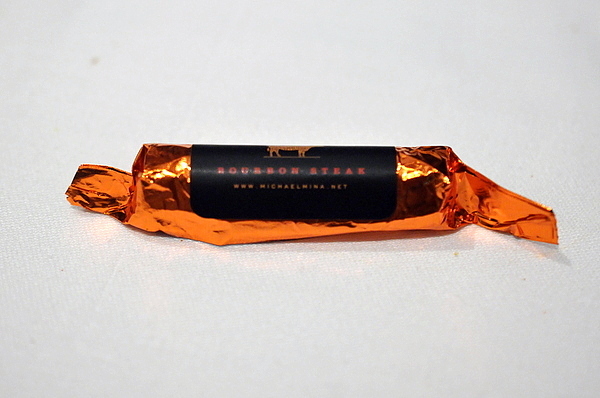 The meal ended with foil wrapped bourbon caramels mixed with bits of hazelnut. The combination had a hint of booziness but mostly tasted like Almond Roca. Though I haven't been to Mina's signature spots in SF, I have tried all his LA/OC spots as well as a few of his Vegas haunts and I have found them very hit or miss. Fortunately, I think we can put Bourbon Steak firmly in the hit column. With its distinctive blend of Japanese-influenced Italian fare, Chef Josef Centeno's Orsa and Winston was one of the most impressive new restaurants of 2013. Centeno established himself as a chef to watch based on the the success of his first two ventures, Baco Mercat and Bar Ama and has upped his game considerably with the tasting-menu focused Orsa and Winston. While the restaurant does offer some a la carte options as well as a family style meal, most diners opt for either the 6-course or 8-course menu. 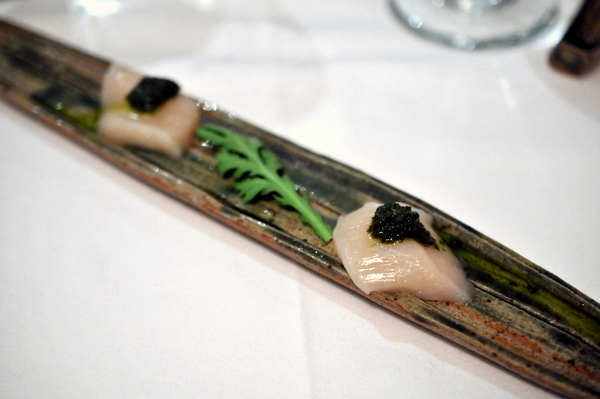 The restaurant also features a 12-course "super omakase" that requires 72 hours advance notice and is only served at the four seat kitchen counter. My first visit we had an even more opulent meal, a 26-course extravaganza that was one of the best meals of 2013. This time around I opted for the 8-course menu, a chance to see how the "proles" experience Orsa and Winston. 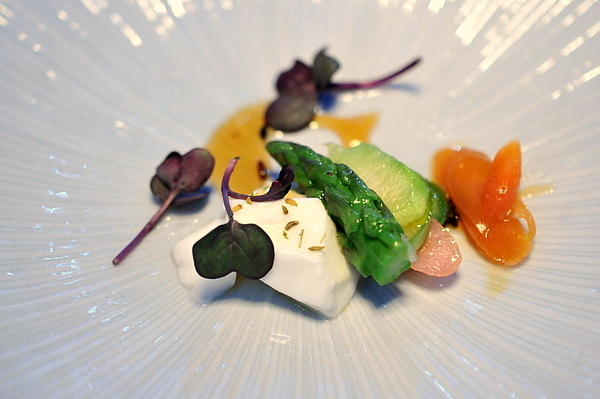 The evening kicked off with an exceptionally nuanced salad of asparagus and carrots. The milk panna cotta is akin to a mild cheese with a sweet lactic richness that underscores the inherent flavor of the salad. A mixture of yuzu and caramel adds an alternating sweet-and-sour flourish to the fresh vegetal bitterness. 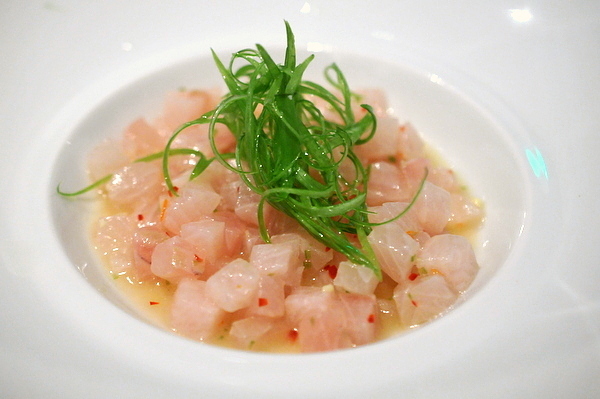 Our first proper course was a tartare of fresh Amberjack. A bit more conventional than the later courses, the tartare has the characteristic oiliness and supple body of the fish mixed with fresh spice from the togarashi and ginger gelée while the weightiness of the cream adds a voluminous body that gives the fish a bit more heft and substance. While I normally appreciate citrus in my dishes, the mandarin was a bit too sweet for the delicate character of the dish. Done right, haricot vert is among my favorite vegetables and this was a spectacular example of why. 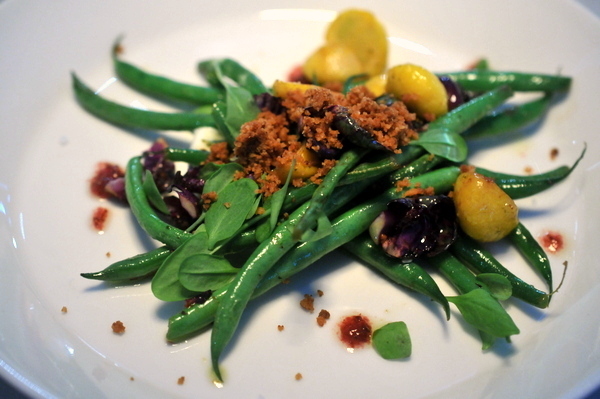 The green beans have a urgent crispness and keen vegetal sweetness. The squash provided a tender meaty counterpoint while the leafy vegetables swing more toward the bitter. The tempura crumbles complete the dish with a buttery savor that provides weight to the mix of vegetables. Diners at the bar are sometimes rewarded with bonus courses and tonight's gift was the oven baked testa with house made milk-bread. Both the head cheese and bread stand on their own, but they are best when taken together. On its own, the testa has a powerful fattiness and keening salinity that demanded the mellowing touch of the foccacia and the astringency of the breakfast radish. This was probably the weakest course of the night. I was expecting a complex mix of shellfish saline and sweet corn but the dish was utterly dominated by the latter. 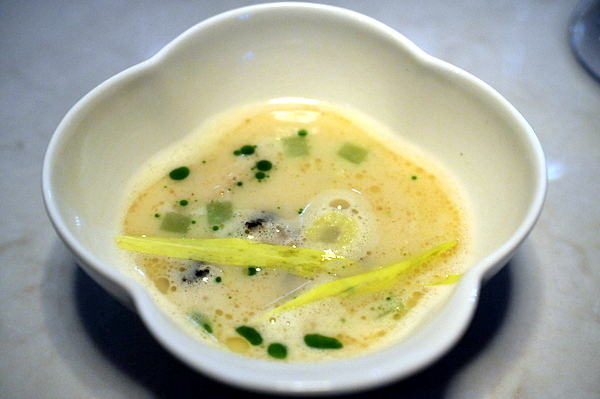 Classic accompaniments of spice and citrus would have played beautifully with the soup's inherent sweetness. I thought the back-to-back soups was a bit odd, but the two were as different as could be. 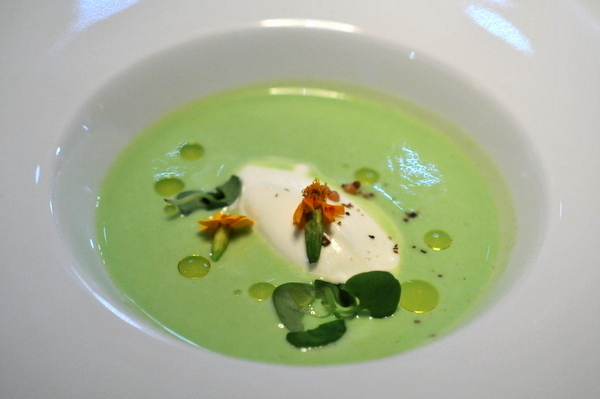 The thick chilled potage is brimming with fresh springtime verdance and delightful flashes of acid from the finger lime. Against the sublime base there is also a reverberating aromatic herbaceousness from the marigold flowers as well as pinpricks of spicy piquancy from the crushed mustard seed. 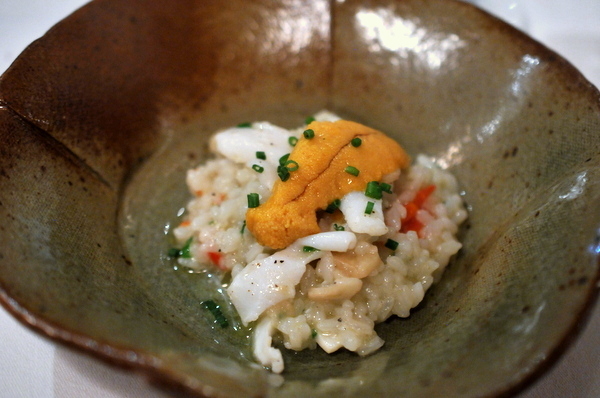 Uni risotto seems to be all the rage these days and its easy to see why. 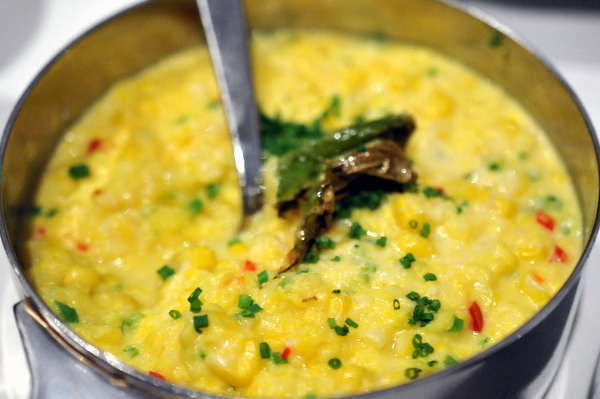 The offal-y sweetness of the uni contrasts nicely with the creamy tang of the risotto rice. 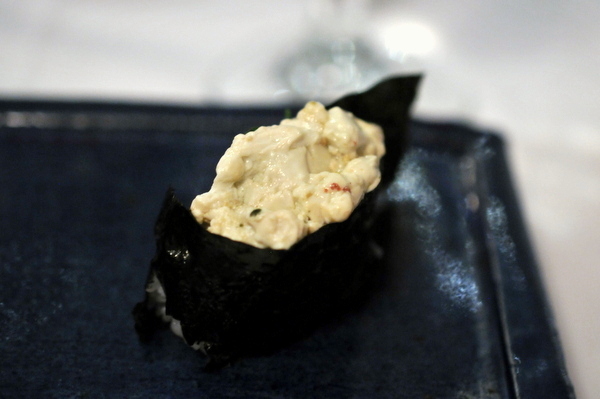 The slivers of geoduck add concentrated bursts of salinity that compliment the uni but with a darker earthy flavor. Moving onto the final courses we started with a spectacular pork belly; crispy skin still wreathed with a fatty bouquet and tender lean meat dripping with porcine savor. The meat would have been overly heavy if not for the bright sour tang of the tomato and the fresh succulent relief of the radish. 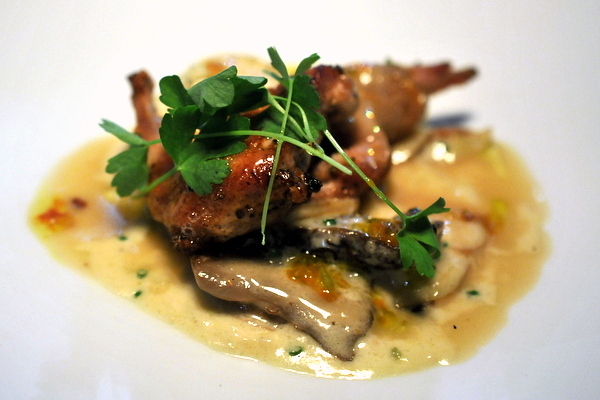 The final savory was a luscious half quail drenched is a cream sauce infused with the luxurious earthy musk of morels and truffles. The fresh sprigs of parsley do wonders to temper the dish as does the unseen infusion of fresh citrus. 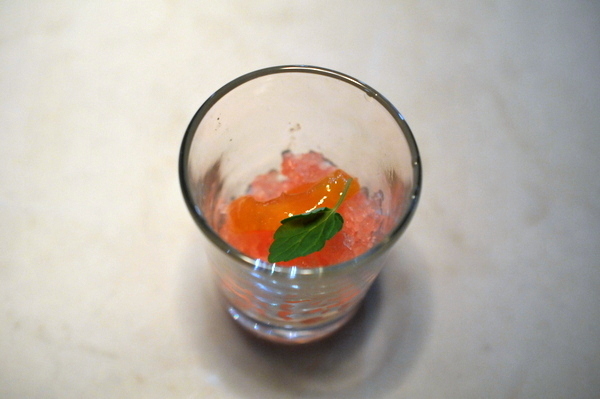 The intermezzo did its job wonderfully, pairing bracing tart grapefruit with a bitter sweet kumquat and soothing fresh mint. 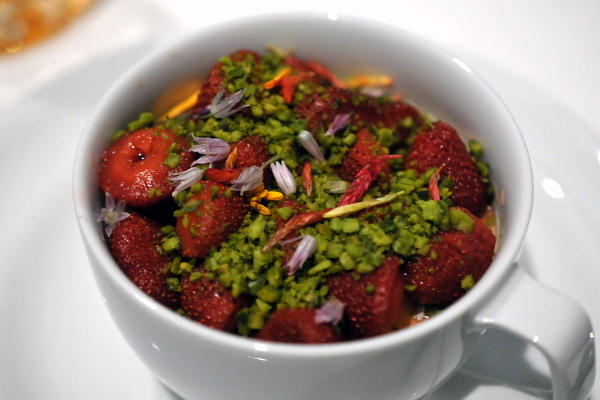 This dessert was right up my alley pairing jammy berries with the buttery sweetness of nougatine. The classic combination is reminiscent of a breakfast yogurt enlivened with tropical flair thanks to the thoughtful inclusion of coconut. 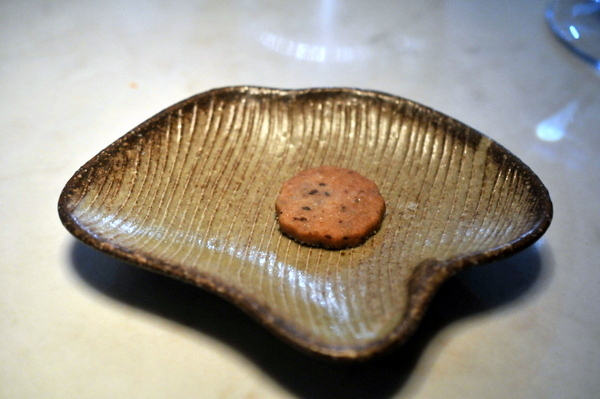 Our final treat was a small shortbread cookie the sweet crumbly treat comes tinged with a touch of earthy savor thanks to the flecks of black olive. 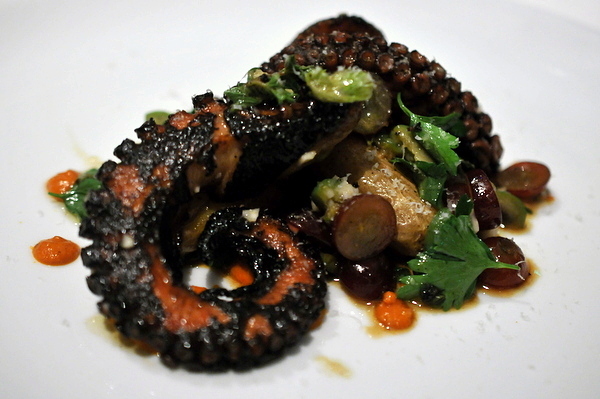 Turns out the regular menu at Orsa & Winston is every bit as impressive as their more ambitious offerings. 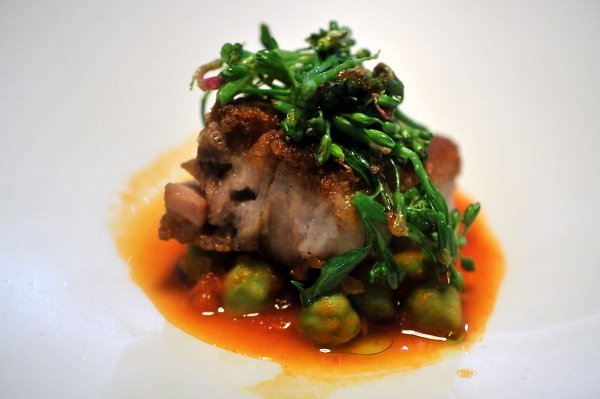 Centeno's food is complex and cerebral yet easily appreciated. 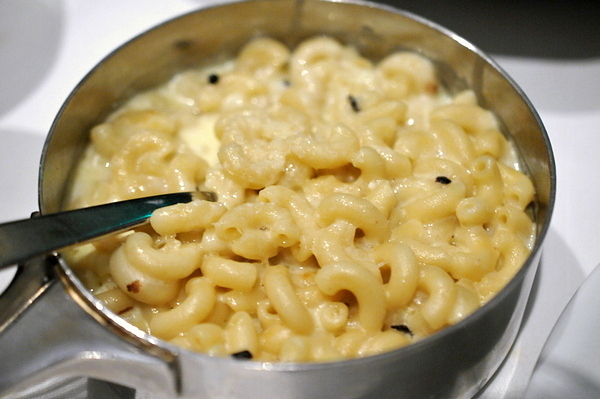 Diners with smaller appetites should definitely consider the 6 or 8 course options. 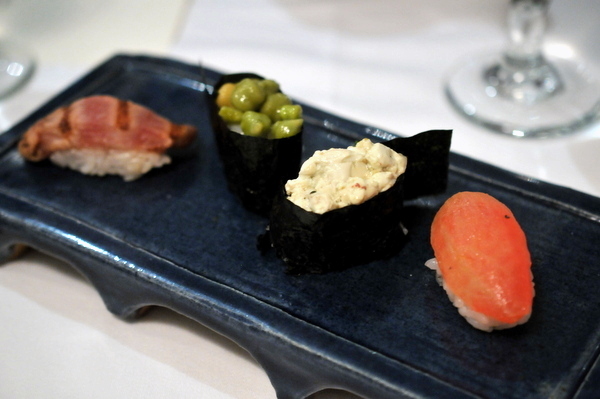 For my part, I can't see myself getting anything less than the "super omakase" on any subsequent visits. 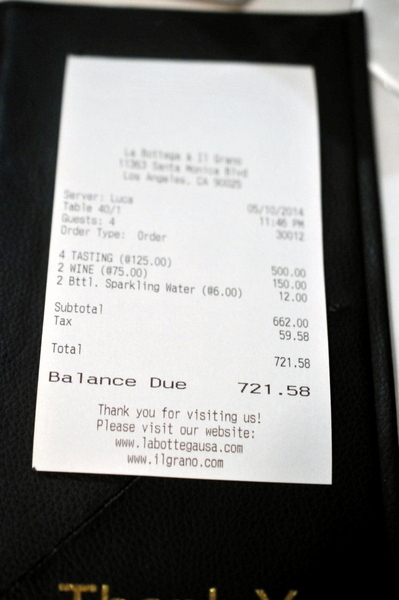 The first time I visited Il Grano for a private dinner, I was thoroughly impressed. 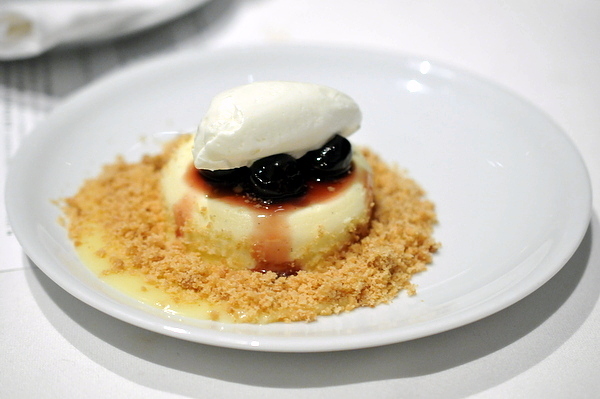 The restaurant has long been among LA's top spots for Italian thanks to Salvatore Marino. The second generation chef believes in sourcing top quality ingredients and letting them speak for themselves and the results were pretty spectacular. 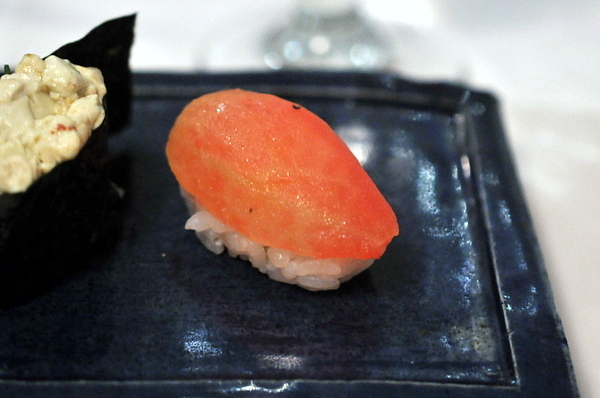 For this meal, Sal teamed up with his long-time friend Morihiro Onodera, the former owner and head chef at Sushi Mori. The two struck up a friendship 15 years ago when Sal started visiting the LA fish markets. At the time high quality fish was the exclusive purview of Japanese chefs and none of the sellers took the young upstart Italian chef seriously. Perhaps moved by his persistence Mori took Sal under his wing and showed him the ropes. Apparently the two chefs have cooked together before and tonight we see the culmination of their long friendship and mutual passion for food. Given the star power behind the dish, seats at this event were extremely limited and largely given to long time patrons and friends of either chef. 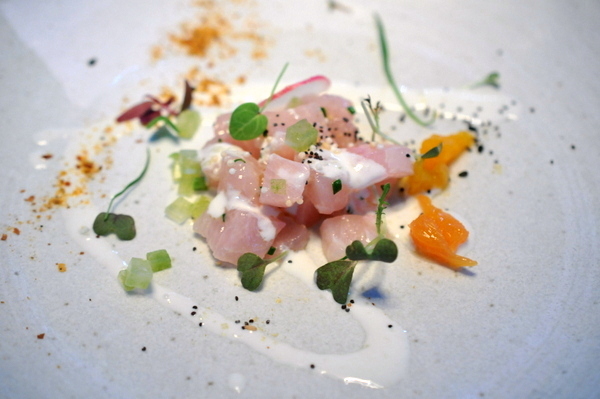 The meal began with a plate of crudo that demonstrate a seamless blend of Italian and Japanese sensibilities. The quartet came with a light pink cocktail laden with refreshing citrus verve and a twinge of vegetal savor from the shishito. 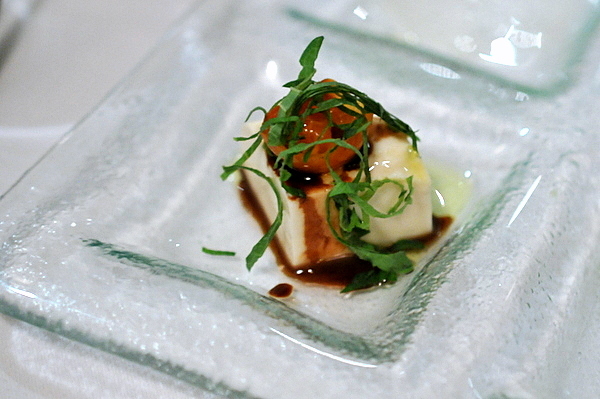 I started off with the nambanzuke, a cuboid of halibut marinated in vinegar. 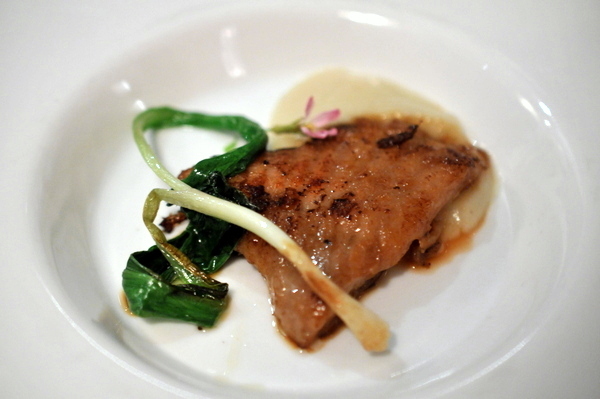 The dense meaty fish has an even temper of sweet soy laced with a nuanced smoky-sweetness. The pickled carrot and onion provided a mix of both textural levity and bracing acidity to moderate the heft of the meat. I was afraid the mixture of snapper and burrata would be too bland but the duo are suitably enlivened by the application of basil and fresh tangy tomato. 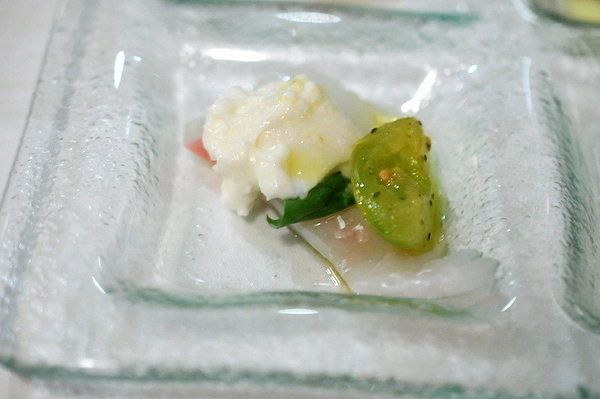 Against this austere backdrop, the fish demonstrates a keen fleshiness while the burrata takes on an almost buttery flavor. Next up was a piece of pristine halibut. The fish itself is faultless, but I found the mix of pea and olive oil a bit heavy and disconcerting. 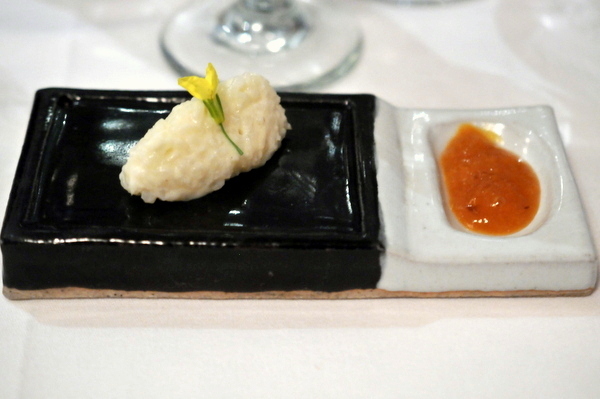 The final of the initial welcoming dishes was something Mori used to serve at his restaurant. Mori makes the tofu himself and the resulting cube has a pillowy creaminess and a mild nutty flavor. The shredded herbs provide soothing herbal flourish while the balsamic adds a much needed jolt of bold sweetness. 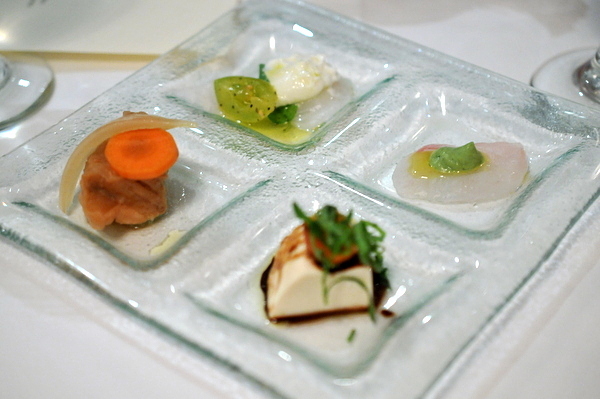 Next up we were presented with another quartet, this time a hybrid Italian-Japanese sushi. The accomplishing wine was surprisingly complex for a mere Bourgogne, with a touch of sweet oxidative depth atop the classic lemon and mineral notes. As much as I enjoy tomato I thought the combination of tomato and rice was going to be a bit boring. The tomato packed a surprising amount of flavor, deep rich sweetness touched with olive and a bit of zesty herbs very reminiscent of a pizza sauce. Next up was a gunkan style roll topped with crab. 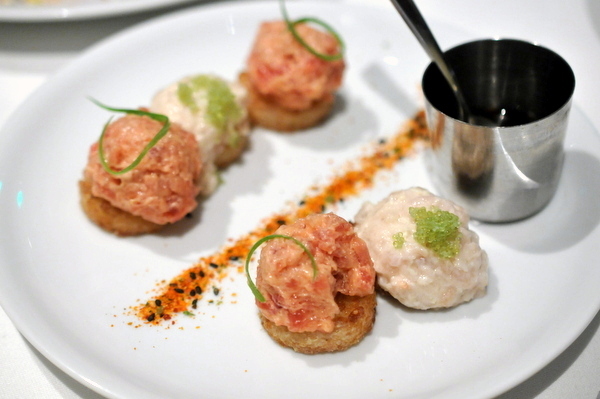 Apparently Sal made a special version of this mid-service mixing the crab with a kani-miso, a sauce made from crab guts. 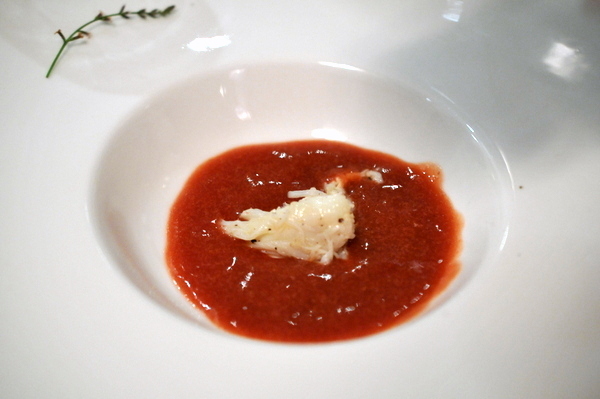 The creamy mixture displays the sweetness of crab meat as well as the dark earthy saline of the innards. The chickpea susci worked a lot better than I expected. The Garbanzos themselves don't show much but the rosemary lends the morsel a sense of comforting homey warmth. 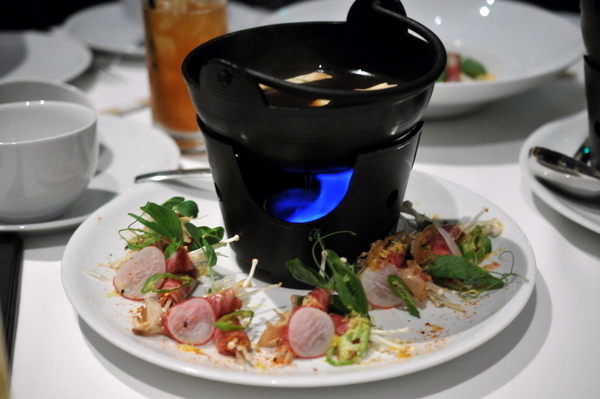 The smoky flair of the tuna was evident the moment our server set the plate in front of me. The flavor proved to be equally expressive with a BBQ like savor over the clean iron-laced tang of the meat.. The Hokkaido Scallop itself was flawless. The texture starts off a bit dry and tacky but quickly morphs into a supple creaminess dripping with classic shellfish sweetness. Like the pea pesto, the chrysanthemum is subtle yet weighty but just didn't work for me. 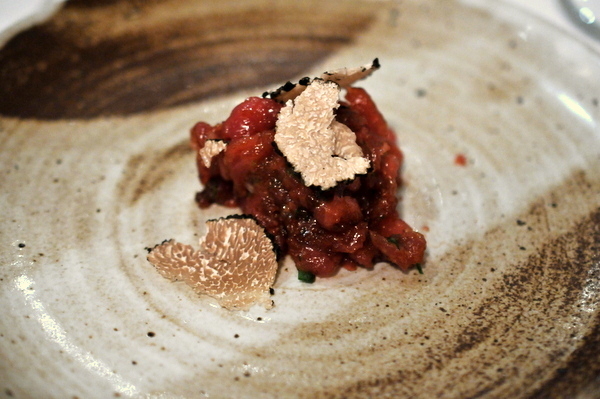 Tuna and truffle? Yes, please! Made from a base of marinated tuna, the tartare exudes lusciousness with a bold piercing soy-savor on top of the fish's inherent clean steely flavor. 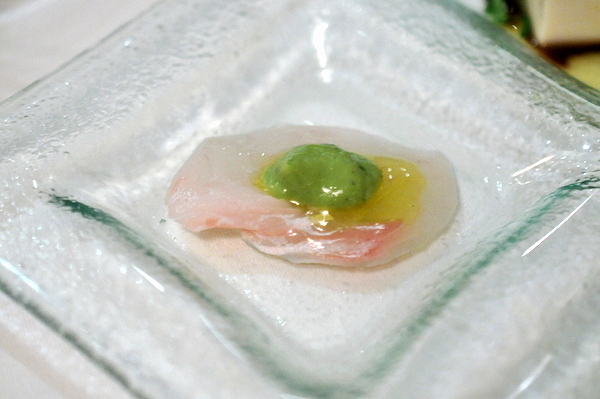 The ground fish is mixed with onion, arugula, and olive oil which adds verdant counterpoint to the potency of the tartare. Last but not least, the black truffle punctuates the mixture with emphatic bursts of earthy musk. The cherry gazpacho starts off with a demonstrative jammy sweetness that gradually develops countervailing herbal and peppery overtones. A bit on the sweet side for my liking but still a very enjoyable course. I was a bit surprised to see two soups back to back but aside from their textures, the two couldn't have been more different. Unabashedly savory where the gazpacho was sweet. 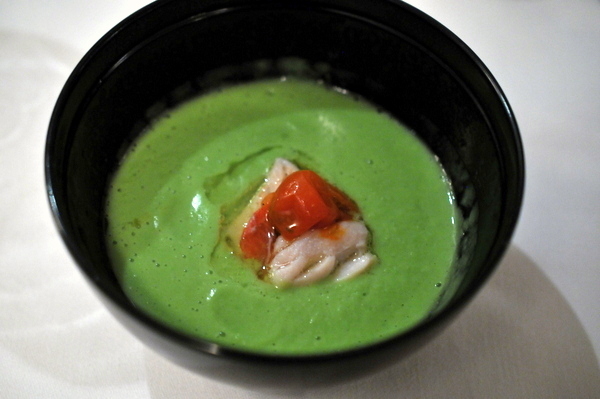 The pea soup has a deep nutty verdance interlaced with a touch of fishy umami savor from the Kinmedai. This was easily one of the most impressive skate wings that I've ever tasted. 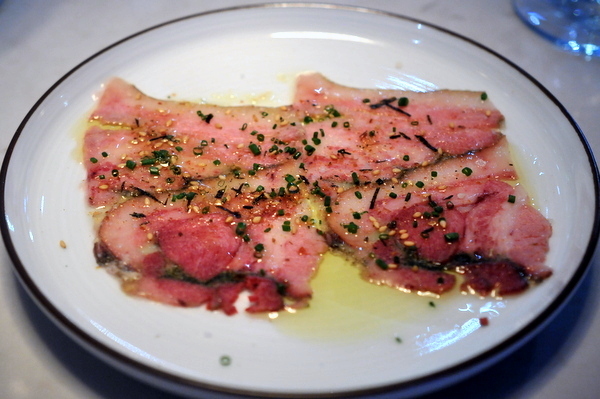 Skate can sometimes have a gelatinous almost fatty mouth feel and while there is a sense of tenderness here, the meat is actually made up of supple well defined fibers. I'm not sure what went into the marinade but the meat gives off a very striking savory-sweetness coupled with a hint of char. 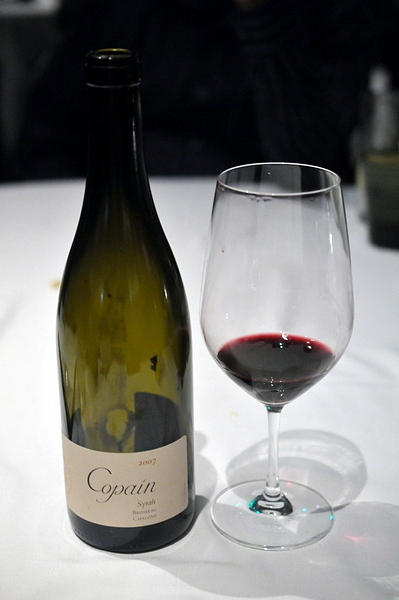 The combination is intoxicating on its own but even more impressive with the fresh springtime relish of the ramps. This was far and away my favorite course of the night and indeed the dish that provided the impetus for the entire meal. Our server mentioned that Mori frequently gets together with Sal and they often make this dish. 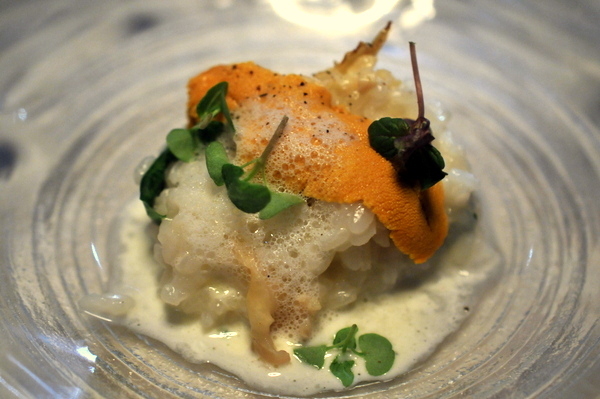 The risotto is exceptionally textured as one would expect from a restaurant of Il Grano's caliber. The rice is imbued with a persistent salinity from the calamari augmented by the sliver of cool decadent uni. 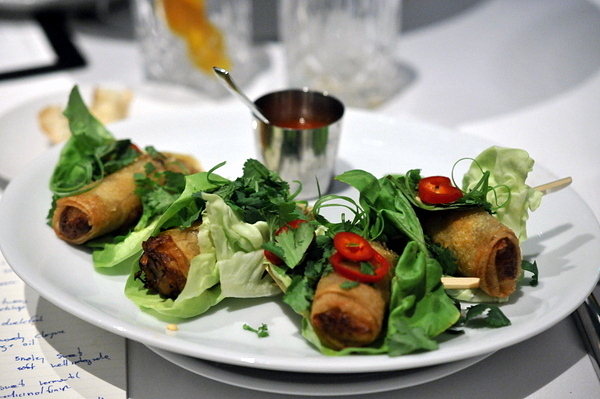 A vigorous spice brings an unexpected but very welcome sense of dynamism to the plate. 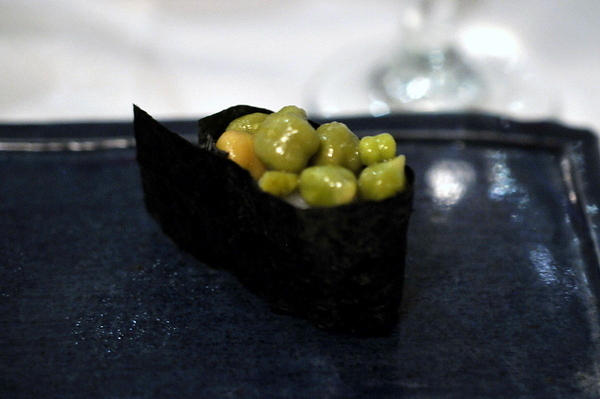 Combining morels, peas, favas, and pancetta; this course isn't particularly groundbreaking but it is utterly delicious. The noodles are dense and plump while the toppings bring a multifaceted blend of earth, savor and herbaceousness. I've never been a fan of milanesa, so it stands to reason that this was the weakest course of the night for me. 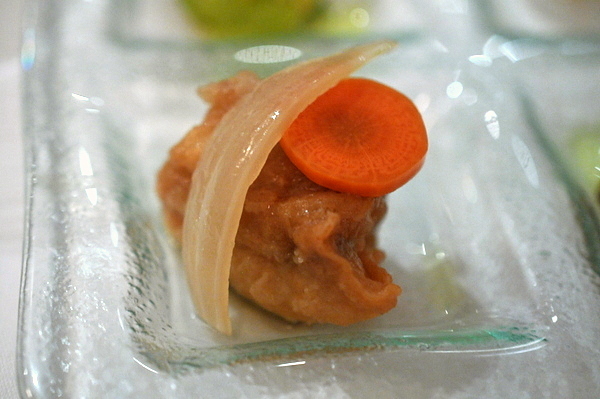 The thinly sliced rabbit was dry and bland which made the apricot confit even more jarring. 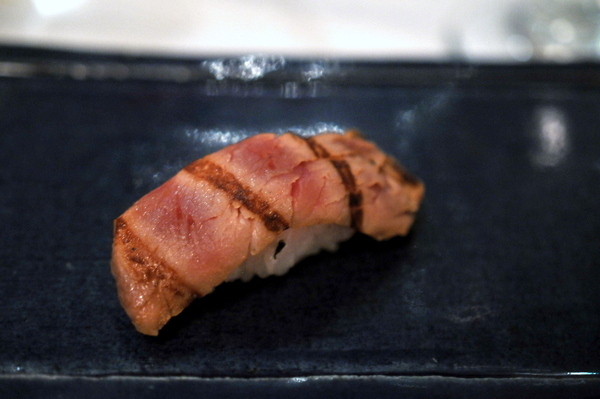 The final savory was a sliver of stupendously marbled wagyu beef. 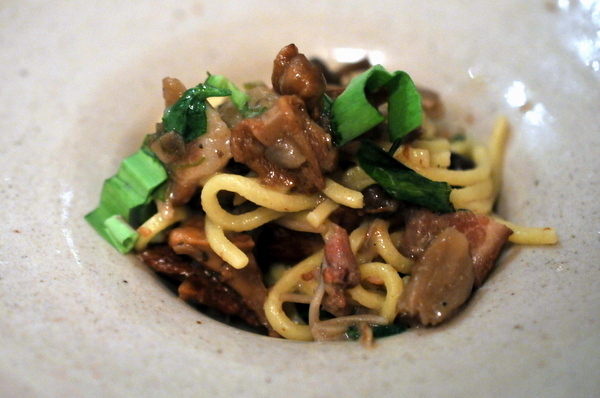 The meat easily would have stood on its own but the robust woody flavor of the shitake and bitter greens bring much-needed contrast to the fat saturated beef. Dessert was a bread pudding made from Mori's vaunted sushi rice. The pudding is a bit bland but the accompanying apricot jam more than made up for the lack of flavor. Indeed the meal was everything I could have hoped for and more. Both Mori and Sal showed off some of their individual signatures but the best dishes harmoniously combined elements from both culinary traditions.